The diseased leaves and vines of Tomato Patch 2011 told me it was time to pick the last of this year’s tomatoes and tear out the nearly dead plants—three or four weeks before I usually do this sad job. I describe the job as a sad one because I just plain hate to see the tomato season end. When we cut the last red fruit that we’ve harvested from the Tomato Patch, we get that nearly hopeless feeling that we’re left with those red “things” we will not be even tempted to buy at the super market until our memories of our mouth-watering home-grown tomatoes fades with our memories of this year’s autumn leaves. I tore out the dying vines over three days, a couple of hours here, a couple of hours there. The first day I picked about 20 big-reds, mostly at breaker stage or beyond, that I thought had a reasonable chance to ripen in our garage, and I took down the cages that had supported the vines. The second day I picked a half colander of little-reds and then removed their cages too. On the third day I pulled out all the plants and wheel-barrowed them to a “compost” pile near the edge of our woods. Since the vines were diseased, I had no thought other than to remove them completely from our vegetable garden. Next year I will plant tomatoes in a totally different area of our garden in order to minimize disease carry-over from this year. 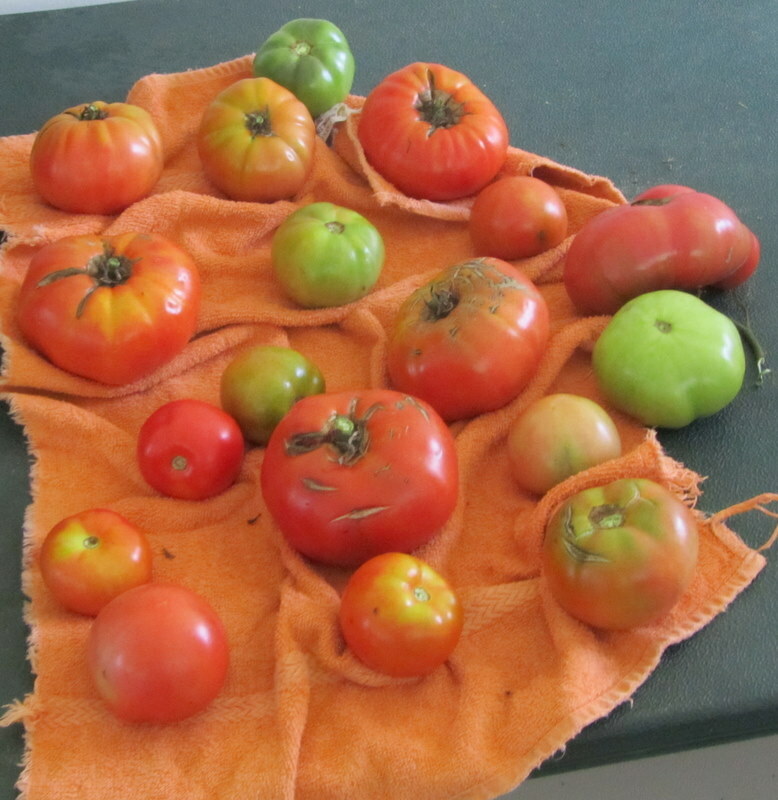 My experience with ripening end-of-season tomatoes is that those with cracks around the stem are much more likely to spoil before fully ripening, so most of the fruit I moved into the garage were small Brandywines and the other varieties with few cracks—Celebrities and Juliets. 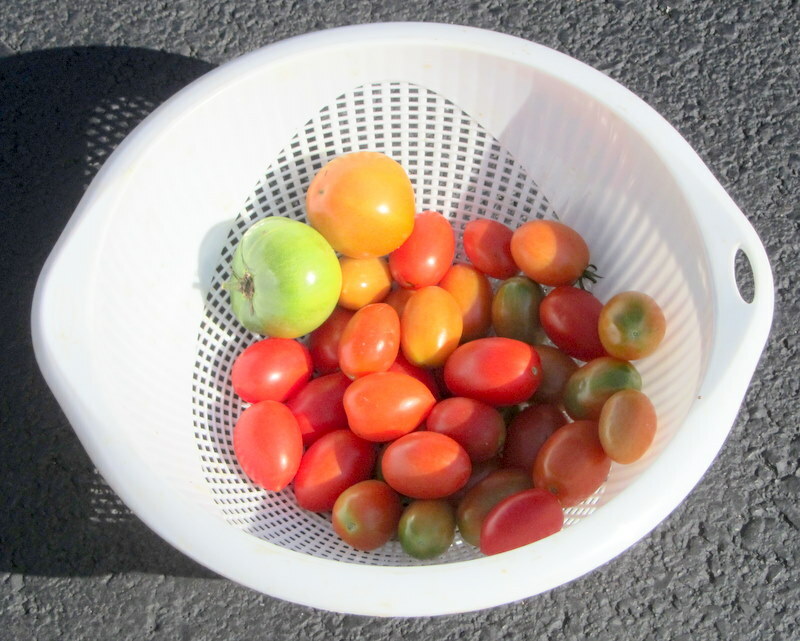 A week after moving the last tomatoes into the garage, I can report that the extra-warm temperatures of the second week of October 2011 are causing them to ripen rapidly, and I have to check them every day to make sure we eat them before they spoil. 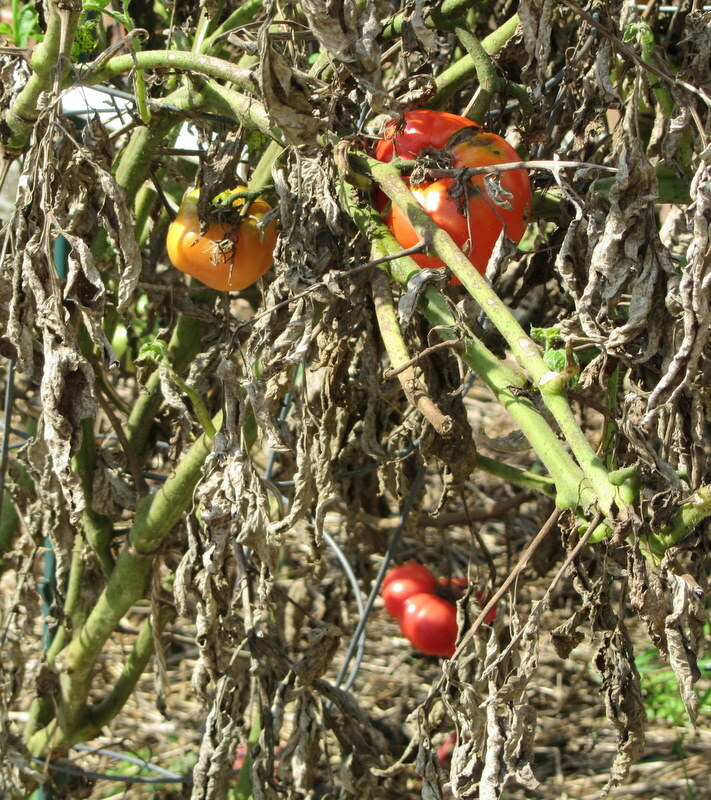 Even though I picked the last of this year’s tomatoes and pulled up the vines, I’m not ready to write “The End” to Tomato Patch 2011. I have a few chores yet to do, and in future postings I’ll show you what I do.